And when it comes to power, to say the least, the framework is well designed! Scrum is a process framework, co-developed by Jeff Sutherland and Ken Schwaber, used for developing and sustaining complex products. « A framework within which people can address complex adaptive problems, while productively and creatively delivering products of the highest possible value. Simple to understand and Difficult to master, that’s the point. I have been doing Scrum for almost 2 years in my current company, in which Waterfall model was used for several years. The training period before the transition was very fast. Maybe, too fast… Ok, let’s say nonexistent. • How roles and responsibilities will be revisited? • How to initialize a backlog? • How to write good user stories? • How to estimate user stories? • How to order a backlog? • How much is “just enough”? Here are some crucial questions we didn’t answer before diving into Scrum. And yes, it has been a pretty messy transition, and still remains chaotic today. Actually, Scrum was first implemented by an experimented ScrumMaster, our CTO, who was working at the company HQ at that time. During a two days visit in our office, in the company branch, he briefly explained us the basic rules, and named a ScrumMaster. It turns out it was the wrong person. This guy didn’t manage to adapt to this new role and after a couple of painful sprints, I ended up getting the ScrumMaster cap. I must say that at that time, almost everyone in the team had tried out this role during one or two sprints. To my great surprise, I enjoyed that position, or let’s say part-time position. Yes, I’m not a dedicated full-time ScrumMaster (yet? ), I’m also a member of the development team. I know that it’s one of the most common questions whether it’s a full-time job or just an extra-role. Recently ScrumMaster Manifesto suggested “We believe the ScrumMaster is a full-time position for one person on one Scrum team”. For sure, I can’t commit myself to specific tasks as I did. In fact, I never really know how much time left I will have during a sprint, but still, I can keep one foot in development, and that’s great. Anyway, after one year and a half of agility, productivity gains and benefits tend to stagnate or even worse, regress. And we didn’t figure out what measures to take to get it back. 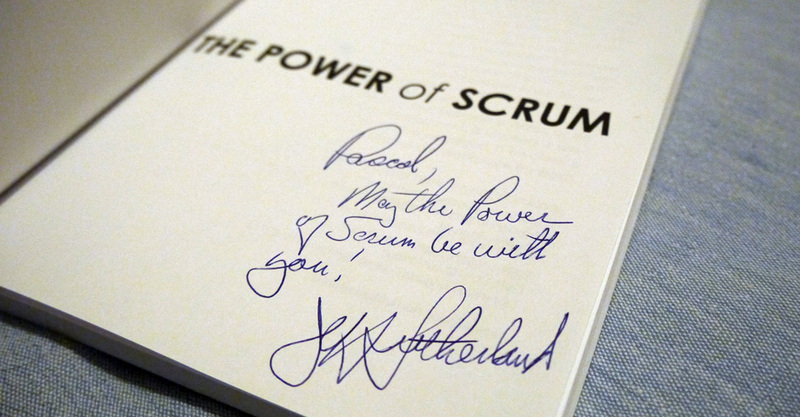 So, when HR came to me asking if I was interested in a ScrumMaster training, moreover hosted by Jeff Sutherland himself, I jumped at this chance! Two days in Paris with the co-author of Scrum, who could say no?! To be honest, when I saw it was a training to become a “Certified ScrumMaster”, I had doubts about its content. Actually, I don’t really like certification process in general. My reaction when I see someone who proudly shows a certification is always the same: “Ok, great, now, show me what you’ve worked on“. I do believe in experience, not in fancy titles. But, as Emerson would say “A foolish consistency is the hobgoblin of little minds”. We were about twenty students with really different backgrounds (developers and managers, experimented and beginners, agile enthusiasts or waterfall fans), split into four teams of five or six people. After a brief introduction about the genesis and main ideas behind the methodology, we have been attending an interactive and dynamic presentation (including slides, videos, paperboard drawing, etc), crisscrossed by various working group and sub-group activities. To sum up, a perfect mixture between lecture, group based activities, anecdotes, all of this served with a trainer always open to questions. That was a truly interactive training session. In fact, the most attractive feature about this training is the huge and rich field experiences of Jeff Sutherland. During these two days, Jeff gave us a substantial amount of advice or recommendations all resulting from his professional background and personal experiences. As for the certification test, it comprises 35 multiple-choice questions and to pass, you must get 24 or more correct. You have 90 days following the training to take it. I didn’t give it a try yet. Will I be a better ScrumMaster if I pass the test? I don’t think so. Successfully passing the driving licence does not automatically mean that you are a good driver. Experience makes all the difference. I remain somewhat skeptical about the certification and its significance level in the professional field. But I know this training enhanced my knowledge with ideas I’m very eager to apply.